The design copies a print by Giorgio Ghisi of Mantua, maker of the Ghisi Shield in the Waddesdon Bequest. The Muses play musical instruments by a stream, accompanied by poets, cupids, Apollo and Pegasus. The pale flesh tints, rich turquoises and purples are typical of Susanne Court’s work. 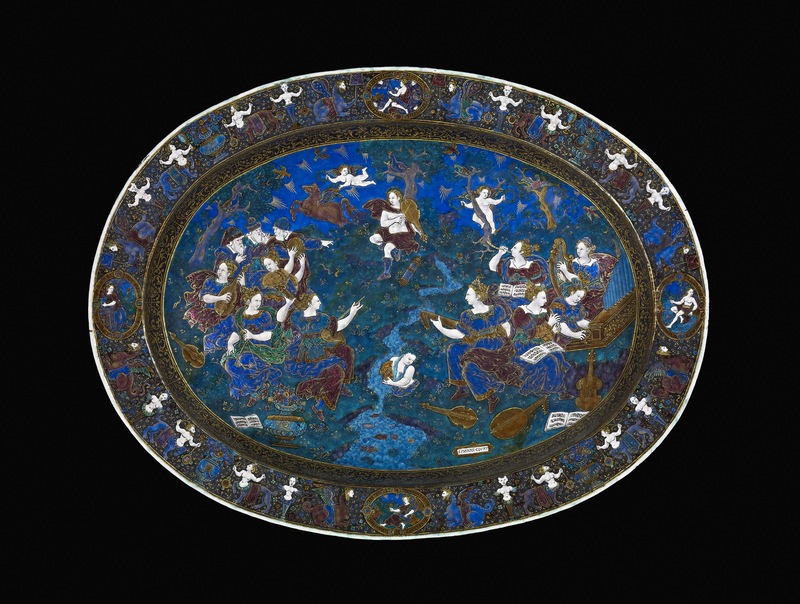 Painted Limoges enamel dish, oval; copper; Apollo and Muses; Apollo seated beside stream, four Muses on left, five on right; three bearded old men in background; in field, two Cupids, Pegasus and river god; grass deep green with gilding, sky sapphire blue; gilt scroll border and flat edge containing medallions representing elements; between are vases, caryatid figures and centaurs; back: gilt ornament, in grisaille a cartouche composed of masks and caryatid figures; adapted from print by Etienne de Laune; inscribed. Four other dishes signed by Suzanne de Court have identical or near identical borders to this dish: one in the Lehman Collection in the Metropolitan Museum of the Conversion of St. Paul (inv. no. 1975.1.1233), one in the Louvre with the Meeting of David and Abigail (inv. no. MR 2410), and another also in the Louvre with the Wise and Foolish Virgins (inv. no. MR 2408), (another version of which is in the Musée de la Renaissance in Ecoen (inv. no. CI 21 966)), and one in the Walters Art Gallery of the Destruction of Pharaoh (inv. no. 44.308). See British Museum reg. no. V,8.118 for the Ghisi engraving on which the scene on WB.48 is based. H. Tait, 'The Waddesdon Bequest', BM London 1981, p. 49, pl.IXB.